Alex McLeish has been named the new Scotland coach. Former Rangers boss McLeish has signed a contract until 2010 and succeeds Walter Smith who resigned to take over at Ibrox on 10 January. McLeish, who recently turned 48 and won 77 caps for his country, said he felt "proud" to become Scotland boss. SFA chief executive David Taylor said: "We have moved quickly to fill the vacancy caused by the unexpected departure of Walter Smith." McLeish has named former Motherwell, Hibernian and Rangers assistant Andy Watson and Roy Aitken as part of his backroom staff. Aitken, the former Aston Villa assistant manager, has been out of football since David O'Leary was axed by the Premiership club. 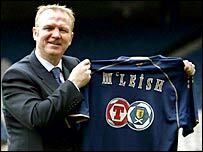 McLeish said to say he was thrilled would be an understatement, and he revealed that the lure of becoming Scotland manager was "too hard to resist". "To be manager of your home nation is a very proud day indeed for Alex McLeish, my family and friends," he said. "I would love to have as smooth a transition as possible, and continue the good work that Walter Smith has done. "Walter has raised hopes of the nation fantastically well and we hope to continue that trend." Taylor said the SFA hoped McLeish could lead the team to success. "It's a particular pleasure to announce the appointment of a former Scotland player to the position of national coach," said Taylor. 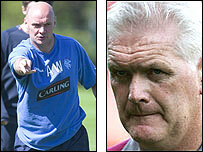 "Alex McLeish played 77 times for Scotland and appeared in three World Cup finals tournaments. "He holds the highest UEFA coaching qualifications and brings to the post 12 years of managerial experience, including international competition. "I am sure all of Scotland will get behind Alex in support of the national side as we try to build on the improved performances of recent times." Taylor said the last couple of weeks had been traumatic, but added that he hoped McLeish could continue Scotland's recent good form. "We believe that in Alex we have found a man to carry on the good work we have already started in our Euro 2008 campaign, and to continue to improve the Scotland team under his leadership over the next couple of years," Taylor added. Scotland have a B international with Finland next month and face important Euro 2008 qualifiers with Georgia and Italy in March.